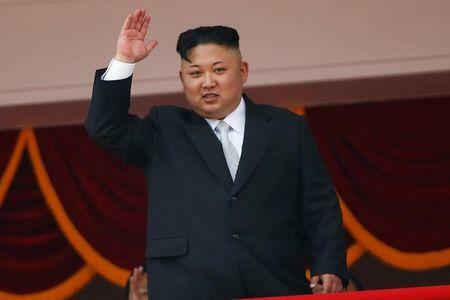 After a year dominated by fiery rhetoric and escalating tensions over North Korea’s nuclear weapons program, Kim used his televised New Year’s Day speech to declare North Korea “a peace-loving and responsible nuclear power” and call for lower military tensions on the Korean peninsula and improved ties with the South. South Korea said it welcomed Kim’s offer to send a delegation to the Pyeongchang Games and hold talks with the South to discuss possible participation. “We have always stated our willingness to talk with North Korea any time and anywhere if that would help restore inter-Korean relations and lead to peace on the Korean peninsula,” a spokesman for the presidential Blue House said. Lee Hee-beom, president of the Pyeongchang Organizing Committee, said the organization welcomed participation by the North Koreans. “The (organizing committee) will discuss relevant matters with the South Korean government as well as the International Olympic Committee,” he said in a statement. But North Korea has so far snubbed his overtures for warmer ties, including an offer to hold inter-Korean military talks about ceasing hostile activities along the border, as it tested missiles at an unpredecented pace and lambasted joint military drills between Seoul and Washington. Rather than encouraging U.S. measures that “threaten the security and peace of the Korean peninsula,” Seoul should instead respond to overtures from the North, and “stop nuclear war exercises with foreign forces, Kim said. Asked by reporters to comment on Kim’s speech, U.S. President Donald Trump simply said “we’ll see, we’ll see”, as he walked into New Year’s eve celebration at Mar-a-Lago, his elite resort in Florida. The U.S. State Department did not immediately respond to a request for comment on Kim’s New Year’s address. This, Kim said, was “irreversible with any force”, making it impossible for the United States to start a war against North Korea. “The whole territory of the U.S. is within the range of our nuclear strike and a nuclear button is always on the desk of my office and this is just a reality, not a threat,” he said, while emphasizing that the weapons would only be used if North Korea is threatened. Despite increased international sanctions imposed over the weapons program, North Korea made progress in areas like fabrics, shoes and tractors, Kim said. While Kim is keen to declare his weapons program a success, he is unlikely to completely end his contentious testing regime, said Scott LaFoy, a ballistic missile analyst at the website NK Pro, which monitors North Korea.